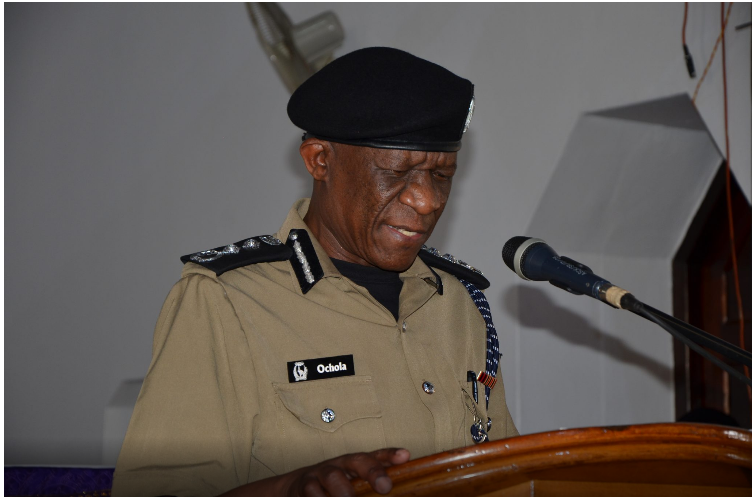 KAMPALA– The year 2018 has been very challenging for the police as evidenced from the high number of murders and kidnaps, the Inspector General of Police, Martins Okoth-Ochola has said. In a Christmas message issued on Tuesday, Mr Ochola said the policing challenges have, however, galvanized the police to work harder to fight crime. “The year 2018 has had many policing challenges. These include among others: murders, kidnaps, thefts targeting both local and foreign investors, fire outbreaks, water and road accidents due to indiscipline by road users,” he said. This year has been marked by kidnaps murders, among them those of Susan Magara, Ibrahim Abiriga and Muhammad Kirumira. Nevertheless, Mr Ochola said the police is ready to defend the country and called for support from the public. “While I am confident that the Police will continue to engage the public to raise crime prevention awareness, I would like to urge all of you to play your part as crime prevention is a shared responsibility. You can do so by taking personal responsibility to prevent crime, for example, by always being alert to suspicious characters and activities around you. And you can also remind your family members, friends and colleagues to similarly do so. By doing so, you are helping to cultivate good crime prevention habits among your own social networks during this festive season. If everyone plays their part, criminals would have less opportunity to harm our loved ones and steal our valuables,” he added. Ladies and gentlemen, 2018 is coming to the end. First of all, I want to thank and also congratulate the entire police fraternity for working hard in service of the people which has enabled us deliver on our mandate of protecting people and their property as stipulated in our Constitution. Our accomplishments have been many and I want to thank the sister agencies and the general public that played a role in making this a success. We have enhanced our traffic and road safety campaigns across the country through sensitization of motorist, visibility on the roads and stepping up patrols on the roads and high ways. The Integrated Highway Patrol Unit will coordinate with the territorial command to secure high ways and allow people to travel safely. Equally, we shall strategically deploy to avert possible accidents at black spots and stop drunken driving. FIKA SALAAMA operations too have been enhanced and well coordinated. Usually, the festive season attracts a lot of excitement driving people to behave recklessly. The UPF has pursued several initiatives this year to disseminate crime prevention messages to the various segments of the community. For example, there were toll-free lines, Station Counter numbers and official lines issued to the general public. Please make maximum use of them. The year 2018 has had many policing challenges. These include among others: murders, kidnaps, thefts targeting both local and foreign investors, fire outbreaks, water and road accidents due to indiscipline by road users. As we get into the festive mood, I wish to caution and urge motorists across the country to be disciplined and follow the traffic laws. The Uganda Police Force (UPF) has made special provisions and compiled traffic management plans to ensure a smooth flow of traffic during these holidays. Our roads will be busy this time of the year with people travelling to various destinations. Road safety is everyone’s responsibility, so I appeal to all motorists to exercise extreme caution while travelling on the road, obey speed limits, fasten your seatbelts, do not drive under the influence of alcohol, ensure that your vehicle is roadworthy and be patient with other road users. The UPF has also issued guidelines on those that will be going to the beaches and places of entertainment. Event organizers and managers have equally been guided on the dos and don’ts to ensure everyone’s security and safety, especially revelers. Parents are implored to talk to their children and guide them to take care and responsibility of what happens around them. Communities and neighborhoods must work together to discuss and address the security concerns in their localities and the local police will help out as they have been guided. I want to take this opportunity to remind all Police commanders and those in specialized units including and not limited to Marines, Fire Brigade and Rescue services, K9, Counterterrorism, Air Wing and traffic Police around the country to map out their areas of operation, study the profiles of residents, deploy adequately and secure the festive season through direct operations and community engagement. While I am confident that the Police will continue to engage the public to raise crime prevention awareness, I would like to urge all of you to play your part as crime prevention is a shared responsibility. You can do so by taking personal responsibility to prevent crime, for example, by always being alert to suspicious characters and activities around you. And you can also remind your family members, friends and colleagues to similarly do so. By doing so, you are helping to cultivate good crime prevention habits among your own social networks during this festive season. If everyone plays their part, criminals would have less opportunity to harm our loved ones and steal our valuables. I give the firm assurance that our Police Officers are on the alert to deal with any criminalities expected in the country. They will not hesitate to act decisively against those who violate the law. On behalf of the Uganda Police Force and on my own behalf, I want to wish you happy holidays and a secure, peaceful, New Year 2019, filled with love, peace and prosperity.